What is the purpose of having iPads in the classroom? In my experience, using engaging lessons and thought-provoking assignments to change the way instruction looks in our classrooms is the sought-after result. The truth is that it takes time to get there. And work. But it’s worth it, and it’s really fun once you accept the iPad for what it is and fully understand what it is not. The iPad certainly does not replace good teaching. Here are three things you can do to move quickly to the fun. Move student desks so you can walk around easily. Long rows are usually not the best. Walk around as you teach. 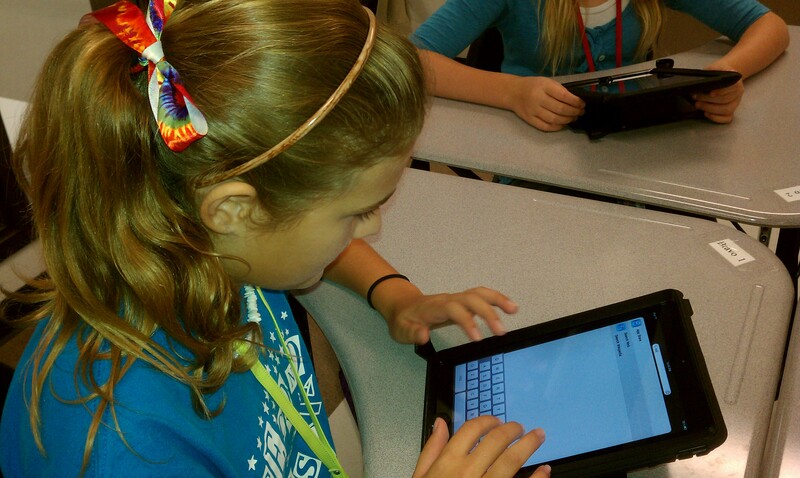 It is the most effective classroom management tip for schools with 1:1 iPads. You don’t need to know how to use all the apps and tools on the iPad. You are a content area expert, not an iPad expert. No one should expect you to be an iPad expert. Find an app you like and know how to use. Practice with it. Use it daily. Don’t worry about using lots of apps. Use the one or two you really know that fit your style and class content. Then add some more later. Let the students choose what apps to use when you want them to demonstrate knowledge. As long as they can provide evidence of learning, what difference does it make which app they use? Let the techie student teach you and other students when they find an app or functionality that works well for your class. Be open to learning from your students. It makes you more accessible and creates another connection between you and your students. Use the most tech-savvy students to help you and others. They are usually glad to do it, and it benefits them as well as the rest of the class. The real crux of the change is that you have to let go of controlling some things while maintaining control of others. It’s a balancing act. Teachers have always had to balance multiple things. You can do this, and you’ll actually have fun! After all, you are a great teacher. These three things touch on the great advice out there for new 1:1 iPad classrooms. If you have deployed iPads in your classroom, use the comment area to share other tips you would add to the list. August 1 is here, and in Texas that means school starts this month. As we prepare the buildings and new teachers, we are making sure every detail is covered for our next deployment of iPads: 2500 at our largest high school. These are the things we are working on, and I thought that they might help you too. You must have coverage for all areas and capacity for twice the number of devices you think you will have. Remember, many students have smart phones, the teachers may have multiple devices (computer, white board, mobile phone, iPod, etc.) and you are likely to deploy more and more devices. Start with it right! Good covers are vitally important. We have chosen to use the Otterbox Defender series and could not be more pleased. The newest version is stellar, and the screen protection has very sensitive touch functionality. That means that once it’s installed, the student should not need to remove it, and that is what we like. We choose to put the school asset sticker on the back where the Apple symbol is, make sure the iPad glass is sparkling clean, and then install a pristine cover. Your goal is NO FINGER PRINTS. If you see fingerprints, so will the student, and as they try to take off the cover, clean and re-cover the device, there is a greater chance for breakage of the cover, the iPad and the loss of the asset sticker. The Otterbox company stands behind their products 100%, and they have made every effort to keep us happy. They replace broken covers, no questions asked, and make good on all of their promises. These are more expensive, but we were able to negotiate a reasonable price through ARC and Otterbox. Insurance & fee- Will you self-insure or use a company like the Worth Ave. Group? Will you charge a user fee? How much? How will you collect and track payment? Documentation- We have a Student Pledge, Mobile Device Guidelines, and an updated. Acceptable Use Policy. Make sure to include things such as Usage Fees, cost of replacement for each piece of equipment, including the charging cord, power brick, and cover. We update these documents annually to reflect current needs and uses of technology. Apps: Who will pay for them? Who will own them? Will all students receive all apps? How will you deploy apps? Will you use an MDM solution? If so, which one? 4. Parent Communication- How will you deliver training and information to parents in your district? What will you include? 5. Teacher support plans-How will you support your teachers through staff development and just-in-time training to ensure quality teaching and learning take place? Will you step up the walk-throughs to catch problem areas quickly and offer help? Read lesson plans more carefully? Offer training in Challenge-Based Learning or Project-Based Learning? What process will your teachers have in place to receive assistance both technically and instructionally? How will they give feedback on the deployment and progress of the project? These are a few of the things you need to decide now–before the crazy days of deployment are upon you. Enjoy the process and document everything you do. You’ll likely be here again and need every reminder! COMING SOON: I will write about our teacher training plans, the challenge of changing instruction, and making the hard decision to go 1:1 iPads. For examples of our documents and plans for our next big deployment, simply click HERE. Disclaimer: These are my opinions only and do not reflect those of my district. We planned. We met to go over the plans. We talked. We planned some more. We made Wikis, created websites, and put it all our plans on spreadsheets and documents. 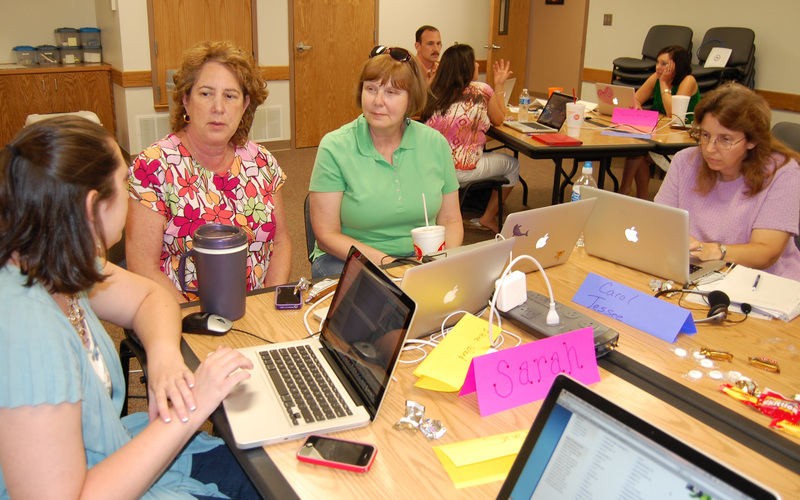 We trained teachers on everything iPad from how to turn it on to how to create an ePub with lesson information. We overwhelmed them with information, and it wasn’t always the information they needed most. What we didn’t do was address some of the simple day-to-day things that we never thought would be an issue. So let me tell you what I wish I’d done, and maybe I can save you a little bit of time and frustration if you are planning a deployment for next year. 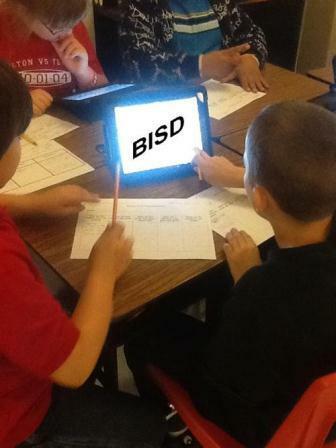 When offering professional development to teachers on integrating iPads, give them training on a management system like Texas’s Project Share from Epsilen (which is releasing an App soon), Edmodo, or Schoology or even eBackPack. You need a way to move information between the teacher and the student. You will want to have a way for students to back up work. We have a WebDav server that has made a huge difference, and there are several services like eBackPack which offer that type of backup solution. Teachers need to know how they are to receive assignments from students and tips on how to organize the student work they do receive. If the students will email work to the teachers, then help the teachers with an organizational format of student folders within class folders in their email. Teachers also want to know how to deliver content to their students. Whether you choose to have them use a teacher webpage, Edmodo or some other system, please tell them a system to use and show them how to use it. Our mistake was telling them multiple ways they could do it and then letting each teacher choose whatever they wanted. It was difficult for the teachers because they couldn’t collaborate easily. Also, they didn’t know which would be best so they tried multiples which was confusing for them and the students. Finally, the students had so many systems to learn that it was confusing and frustrating for them, too. Everyone agreed that the better way to do this would have been to choose one, train how to use it and stick with it for a year. If you do this, all of your students will have the continuity between classes, all of your teachers can help each other and collaborate easily, and you will have one system to support. Finally, give your teachers clear expectations, not only of the iPad use in the classroom, but of how classroom management should look. Will you expect the iPads to be used daily? Say so. Will you expect lesson plans to reflect use of apps or online resources. Be clear and specific. Your teachers want to do what is expected, and they need to know very clearly from the beginning what that is. We had an expectation that the iPads would be used multiple times a week if not daily. However, we did not model or show teachers what it might look like when students were not using the iPads. Several weeks into the school year, we still had teachers who were worried about telling students to put the iPad down. Obviously, it was not clear enough to the teachers from the beginning that we never expected it would be used every minute of every day. Had we anticipated that this would cause concerns and anxiety, we would have been much more clear and we could have modeled classroom management techniques for our teachers. “Apples UP!” This means students are to put the iPads face down on their desk with the Apple symbol facing up. No one is working on the iPad. Everyone is listening. Use background colors for assessments and individual work to be graded. If your Google form or quiz has a green background, any other color on the screen will be very obvious as you glance around the room. That works for all items you want to be securely graded. Paper and pen back-up plan. Students who do not follow rules won’t have the iPad for that period and will resort to the old-fashioned way. Give up a little control! Don’t focus on requiring a specific product. Tell the students what needs to be in their final product and then let them create the product of their choosing. Teachers don’t have to feel that pressure of knowing all the tools in every app, and that is a great relief to them. From all reports, the student work improves greatly when students are given the choice to do even greater things than you could imagine. I hope these tips will help those of you deploying iPads next year. When you plan your teacher training and handouts, make sure to think of the little day-to-day things required of everyone. Once you have those clearly defined, your teachers will be free to conquer the rest! Find TericeSchneider on Twitter, LinkedIn, Pinterest, and Polyvore. At South Belton Middle School where we issue an iPad 2 to every student, we have discovered that protecting the device requires forethought and a couple of extras. Our wonderful instructional facilitator, Kevin Rasco, realized on the first rainy day that our kids who walk home might have wet iPads by the time they reached their destination. Quick thinking and a trip to our local Walmart with a few bucks had teachers and administrators handing out plastic freezer bags to students as they left the building. The covered iPads fit neatly inside, and the grateful students headed off without a care. Additionally, you need a few extra cases on hand. The best case scenario is that when a student has an accident of some sort and drops the iPad, the case takes the hit and leaves the iPad untouched. We’ve seen that several times with the Otterbox Defender cases. However, the case was broken in some cases. Otterbox was quick to replace them, but we didn’t want a moment with the iPad unprotected. So we purchased a few extra cases to have on hand at all times. I recommend this practice. The Otterbox folks have been great to work with and replace what is broken. Also, if you purchase a cover like the Otterbox Defender that has two pieces (a case for the iPad and a cover/stand), you will want extra cover/stands. Finally, you’ll need extra chargers for the iPads. We issued a charging cord with each iPad, but we had to order a few more to replace those that were broken or lost. We plan to have charging stations next year for those iPads that show up at school with no charge. In general, this has not been a huge problem, but we feel we can avoid it totally by having a charging station or two. Feel free to contact me if you have any questions about what we have learned and how we plan to improve upon what we have done so far. If you are considering iPads as a 1:1 device or a classroom set for your school, you will need to have support and maintenance systems in place before you deploy. These are some questions you should ask. Who do students go to with issues? Will you have a HelpDesk? Do you have a spot for students to check out/in iPads? Some ideas include the libary, a designated office or lab or the homeroom teacher. The librarian at South Belton Middle School has become an iPad specialist this year just because she was the first one students turned to when they had issues with their iPads. We didn’t realize that would happen, but it was the natural product of having the librarian check out the devices to the students. Our students go to the library, the office of the instructional facilitator, or the campus technology facilitator for help. We plan on training students to serve as tech support before school, after school, during homeroom and lunches next year. Who do teachers call for help? Teachers on our campus also contact the Instructional Facilitator or the campus Technology Facilitator when they have issues. The technology department also has help available for those teachers. What will you do if a student accidentally breaks an iPad? Especially if you send devices home with students, you can expect some breakage and hardware issues. You need to plan on 5%-10% depending on your cover and the age of your students. Will you purchase insurance? You can use an insurer like the Worth Avenue Group to insure for breakage, accidents and even loss or theft for around $50. Will you ask the student to purchase insurance or pay a user fee? Some districts choose to build the cost of the insurance, along with the cost of covers and apps, into the cost of the iPad when they budget. Others ask students to pay an annual user fee (typcially $25-$50) and the district designates those funds for repair and replacement of damaged, lost or stolen iPads. Who will collect funds? We have tried having the principal’s secretary collect a user fee this year; however, it was very burdensome on her since we let parents pay small amounts over time. If we continue with this plan, we will need some automated way to remind parents of the amount they owe and a different person to collect. Your district administrators, including the campus principals involved, business office staff and technology director, will need to discuss these details, map out a plan, and communicate with parents long before the first day of school. Decide these things early and have systems in place before problems arise. These are just a few things I have learned through our 1:1 iPad projects at a 735 student middle school where the students take the devices home plus class sets in two rooms at our largest high school and in a few elementary school classrooms. ***Coming Soon: Now that Apple has released a Configuration tool, I will try it out and let you know!